Step 1. 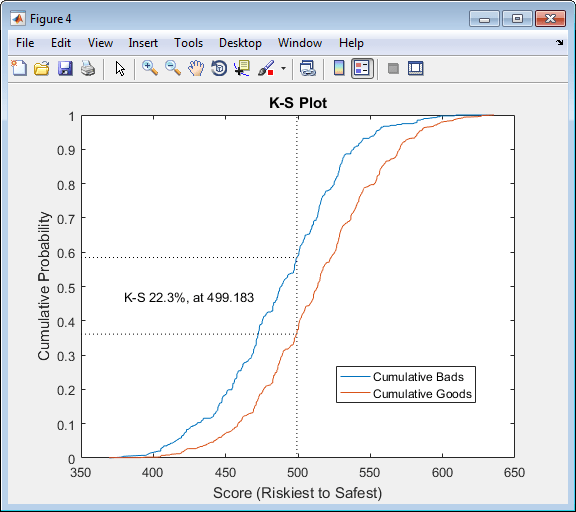 Load credit scorecard data into the MATLAB workspace. Step 2. Import the data into Binning Explorer. Step 3. Fine-tune the bins using manual binning in Binning Explorer. Step 4. Export the creditscorecard object from Binning Explorer. Step 5. Fit a logistic regression model. Step 6. Review and format scorecard points. Step 7. Score the data. Step 8. Calculate the probability of default. This example shows how to create a credit scorecard using the Binning Explorer app. Use the Binning Explorer to bin the data, plot the binned data information, and export a creditscorecard object. 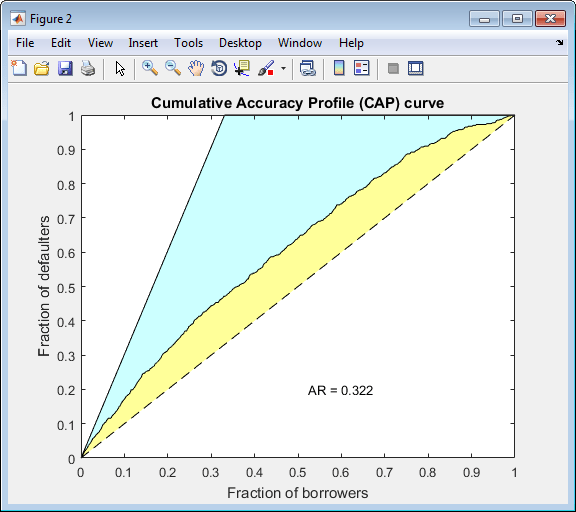 Then use the creditscorecard object with functions from Financial Toolbox™ to fit a logistic regression model, determine a score for the data, determine the probabilities of default, and validate the credit scorecard model using three different metrics. Use the CreditCardData.mat file to load the data into the MATLAB® workspace (using a dataset from Refaat 2011). 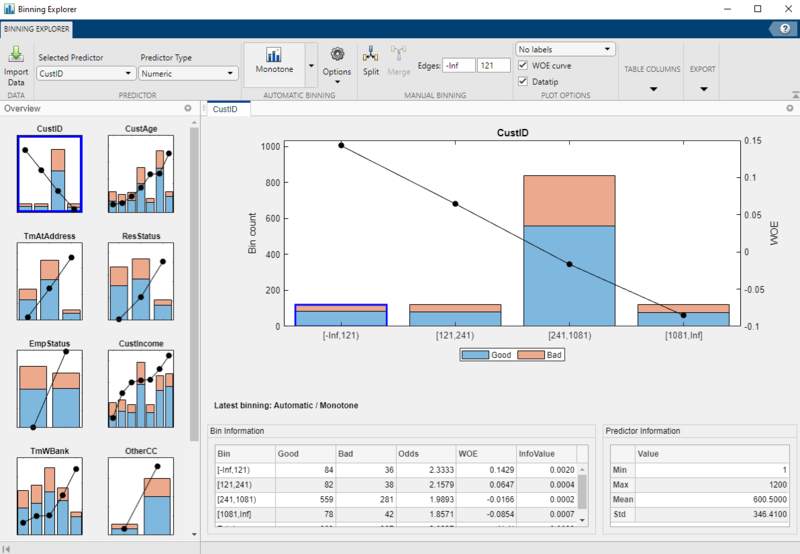 Open Binning Explorer from the MATLAB toolstrip: On the Apps tab, under Computational Finance, click the app icon. Alternatively, you can enter binningExplorer on the MATLAB command line. For more information on starting the Binning Explorer from the command line, see Start from MATLAB Command Line Using Data or an Existing creditscorecard Object. From the Binning Explorer toolstrip, select Import Data to open the Import Data window. Under Step 1, select data. Under Step 2, optionally set the Variable Type for each of the predictors. By default, the last column in the data ('status' in this example) is set to 'Response'. The response value with the highest count (0 in this example) is set to 'Good'. All other variables are considered predictors. However, in this example, because 'CustID' is not a predictor, set the Variable Type column for 'CustID' to Do not include. If the input MATLAB table contains a column for weights, from the Step 2 pane, using the Variable Type column, click the drop-down to select Weights. For more information on using observation weights with a creditscorecard object, see Credit Scorecard Modeling Using Observation Weights (Financial Toolbox). If the data contains missing values, from the Step 2 pane, set Bin missing data: to Yes. For more information on working with missing data, see Credit Scorecard Modeling with Missing Values (Financial Toolbox). Under Step 3, leave Monotone as the default initial binning algorithm. Click Import Data to complete the import operation. 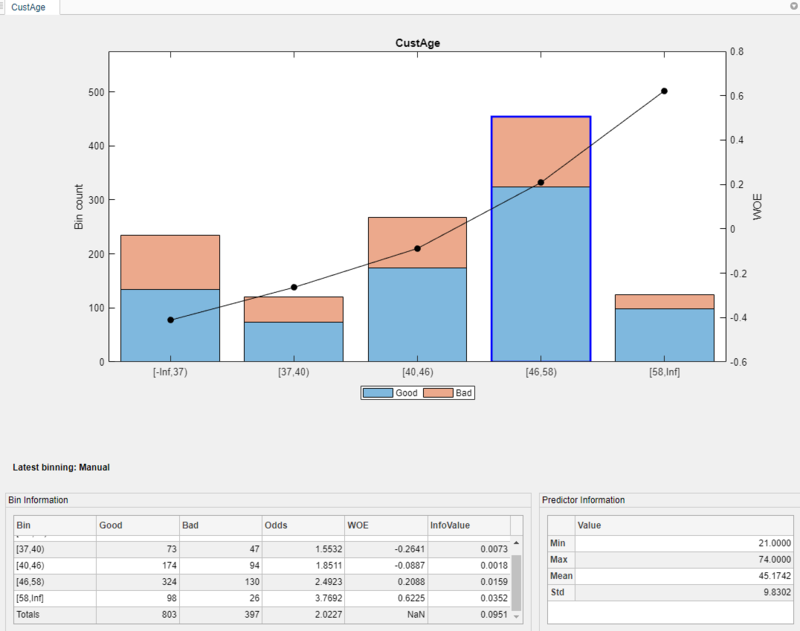 Automatic binning using the selected algorithm is applied to all predictors as they are imported into Binning Explorer. The bins are plotted and displayed for each predictor. By clicking to select an individual predictor plot, the details for that predictor plot display in the Bin Information and Predictor Information panes at the bottom of the app. 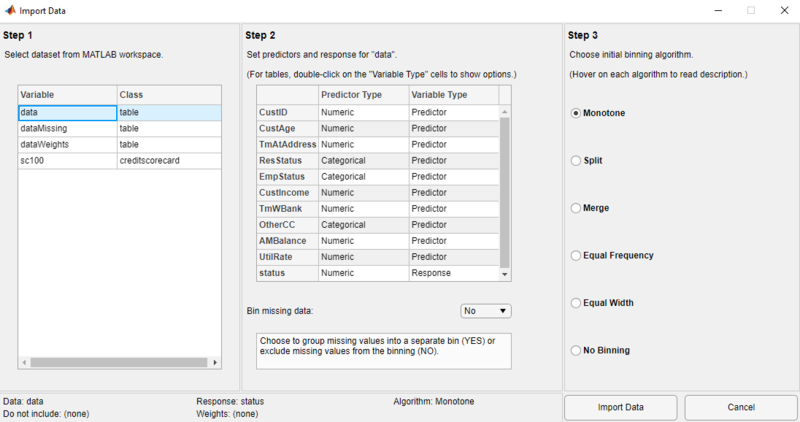 Binning Explorer performs automatic binning for every predictor variable, using the default 'Monotone' algorithm with default algorithm options. A monotonic, ideally linear trend in the Weight of Evidence (WOE) is often desirable for credit scorecards because this translates into linear points for a given predictor. WOE trends are visualized on the plots for each predictor in Binning Explorer. Perform some initial data exploration. Inquire about predictor statistics for the 'ResStatus' categorical variable. Click the ResStatus plot. The Bin Information pane contains the “Good” and “Bad” frequencies and other bin statistics such as weight of evidence (WOE). For numeric data, the same statistics are displayed. Click the CustIncome plot. The Bin Information is updated with the information about CustIncome. Click the CustAge predictor plot. Notice that bins 1 and 2 have similar WOEs, as do bins 5 and 6. To merge bins 1 and 2, from the Binning Explorer toolstrip, click Manual Binning to open the selected predictor in a new tabbed window. 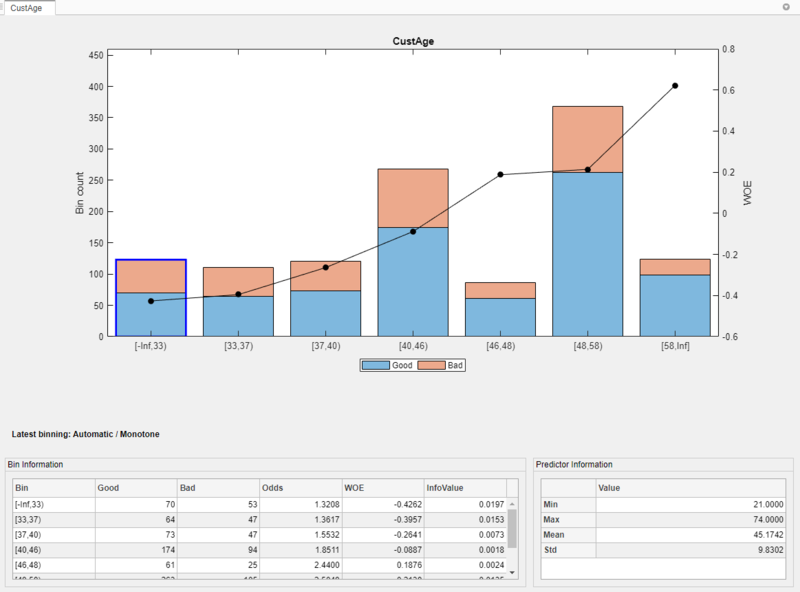 Alternatively, double-click the predictor plot to open the Manual Binning tab. Select bin 1 and 2 for merging by using Ctrl + click to multiselect these bins to display with blue outlines. On the Binning Explorer toolstrip, the Edges text boxes display values for the edges of the selected bins to merge. Click Merge to finish merging bins 1 and 2. The CustAge predictor plot is updated for the new bin information and the details in the Bin Information and Predictor Information panes are also updated. Next, merge bins 4 and 5, because they also have similar WOEs. The CustAge predictor plot is updated with the new bin information. The details in the Bin Information and Predictor Information panes are also updated. For CustIncome, merge bins 3, 4 and 5. For TmWBank, merge bins 2 and 3. For AMBalance, merge bins 2 and 3. Now the bins for all predictors have close-to-linear WOE trends. After you complete your binning assignments, using Binning Explorer, click Export and provide a creditscorecard object name. 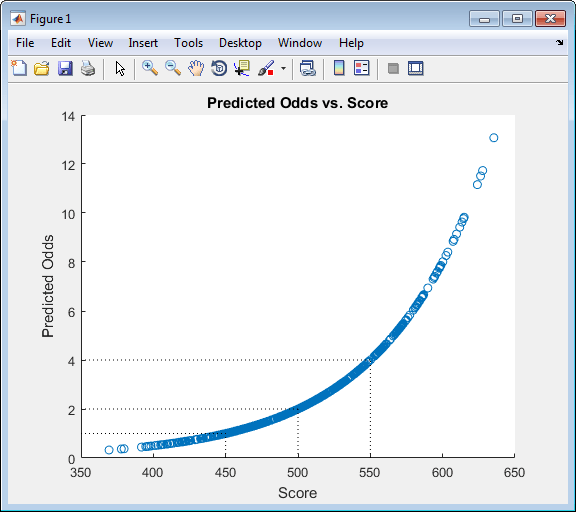 The creditscorecard object (sc) is saved to the MATLAB workspace. Use the fitmodel function to fit a logistic regression model to the WOE data. fitmodel internally bins the training data, transforms it into WOE values, maps the response variable so that 'Good' is 1, and fits a linear logistic regression model. By default, fitmodel uses a stepwise procedure to determine which predictors belong in the model. After fitting the logistic model, the points are unscaled by default and come directly from the combination of WOE values and model coefficients. 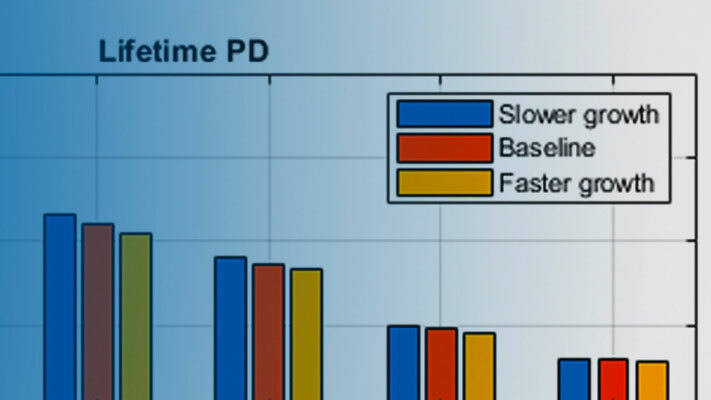 Use the displaypoints function to summarize the scorecard points. Use modifybins to give the bins more descriptive labels. Points are scaled and are also often rounded. To round and scale the points, use the formatpoints function. For example, you can set a target level of points corresponding to a target odds level and also set the required points-to-double-the-odds (PDO). Use the score function to compute the scores for the training data. You can also pass an optional data input to score, for example, validation data. The points per predictor for each customer are provided as an optional output. 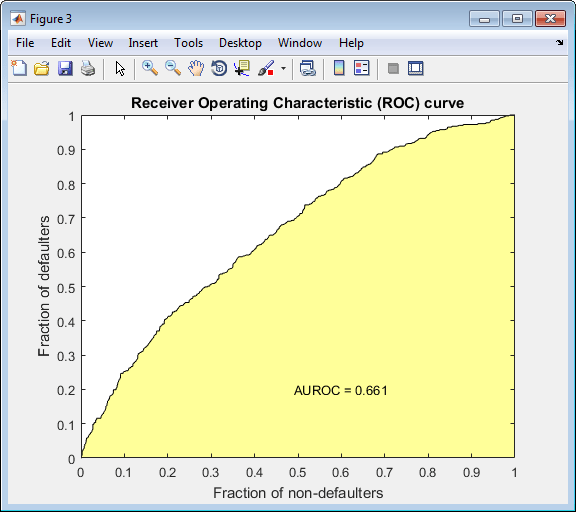 The creditscorecard object supports three validation methods, the Cumulative Accuracy Profile (CAP), the Receiver Operating Characteristic (ROC), and the Kolmogorov-Smirnov (KS) statistic. For more information on CAP, ROC, and KS, see validatemodel.